Poly-β-hydroxybutyrate (PHB) mobilization in bacteria has been proposed as a mechanism that can benefit their host for survival under stress conditions. Here we reported for the first time that a stress-induced system enabled E. coli, a non-PHB producer, to mobilize PHB in vivo by mimicking natural PHB accumulation bacteria. The successful expression of PHB biosynthesis and PHB depolymerase genes in E. coli was confirmed by PHB production and 3-hydroxybutyrate secretion. Starvation experiment demonstrated that the complete PHB mobilization system in E. coli served as an intracellular energy and carbon storage system, which increased the survival rate of the host when carbon resources were limited. Stress tolerance experiment indicated that E. coli strains with PHB production and mobilization system exhibited an enhanced stress resistance capability. This engineered E. coli with PHB mobilization has a potential biotechnological application as immobilized cell factories for biocatalysis and biotransformation. A wide variety of microorganisms are able to accumulate polyhydroxyalkanoates (PHAs) as intracellular carbon/energy storage compounds or reducing power for coping with changing, often oligotrophic environments [1, 2]. Various PHAs, as well as the best-known poly 3-β-hydroxybutyrate (PHB), were found to be accumulated and degraded as required under environmental conditions by most natural PHAs producing bacteria . When the environment is sufficient with carbon source or the C/N ratio is quite high (>20), the PHAs accumulation is much faster than degradation [4, 5]. While facing different stresses, such as low nutrient availability and detrimental physical, chemical, or biological factors, these bacteria begin to mobilize PHAs to conquer those unfavorable environments. The biosynthesis and degradation of PHAs is a cyclic mechanism that has already been found in many bacteria, such as Ralstonia eutropha, Azotobacter beijerinckii and Hydrogenomonas eutropha [6–8]. The in vivo PHB biosynthesis pathway is conducted by the successive action of β-ketoacyl-CoA thiolase (phb A), acetoacetyl-CoA reductase (phb B) and PHB polymerase (phb C). However, PHB degradation, which has been investigated for years, was divided into intracellular mobilization and extracellular degradation. Intracellular PHB mobilization is initialized by the hydrolization action of intracellular PHB depolymerase [9, 10]. The depolymerized product, (R)-3-hydroxybutyric acid (3HB) , is then metabolized in vivo as carbon and energy source by cells or excreted into the environment. To metabolize (R)-3-hydroxybutyric acid, cells have to convert it to acetoacetate by (R)-3-hydroxybutyric acid dehydrogenase  or activate it to a CoA derivative by enzymes such as acyl-CoA synthetase or thioesterase [13–15]. Acetoacetate can be converted to two molecules acetyl-CoA under the function of β-ketothiolase by primarily activated to acetoacetyl-CoA , then acetyl-CoA is further metabolized via the tricarboxylic acid (TCA) cycle or the glyoxylate cycle; while (R)-3-hydroxybutyl-CoA can be immediately epimerized to the (S)-isomer in order to be catabolized by β-oxidation pathway for energy release. Escerichia coli, which possesses neither PHB synthase nor depolymerase genes, was thought to be one of the best PHA production candidates. By metabolic engineering, recombinant E. coli was confirmed to accumulate PHB up to 90% of dry cell weight [6, 17, 18]. When co-expressed with phaZ 1 gene from R. eutropha, recombinant E. coli was able to depolymerize PHB and secrete 3HB into the medium [9, 19]. However, can E. coli realize the complete PHB mobilization in vivo? Can E. coli obtain any benefit on survival in stress conditions from the PHB mobilization as described for several wild type species e.g. Azospirillum brasilense and Sinorhizobium meliloti? To answer these questions, we constructed a stress induced PHB mobilization system in E. coli by mimicking the natural PHB producer. The stress-induced system was developed by introducing 5'-untranslated region of rpoS . This stress-induced region (SIR) fragment promotes the transcription of rpoS gene, which is induced under stationary phase or under stress conditions . The engineered E. coli was then investigated for its stress resistance capability. To mimic the PHB metabolic cycle in E. coli, we first constructed a PHB accumulation strain by introducing a stress induced PHB production system in E. coli DH5α. 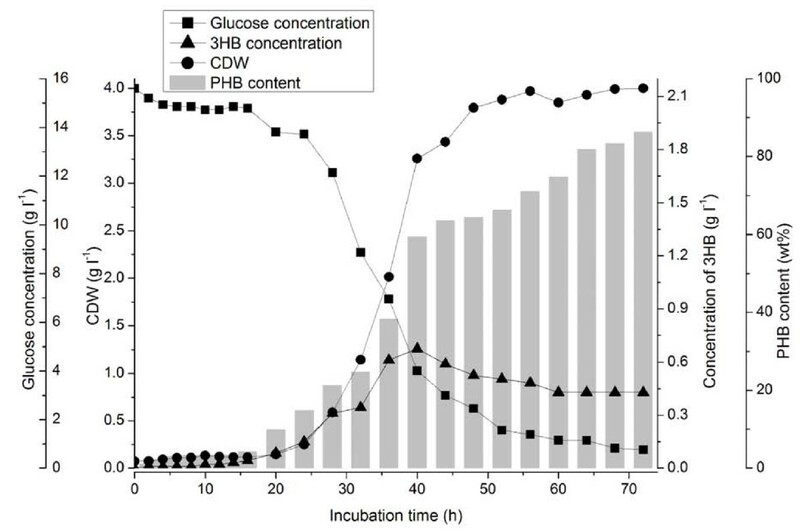 The engineered E. coli DH5α (pSCP-CAB), which contained the PHB operon and a stress induced promoter, was confirmed to produce PHB in glucose medium at the late exponential phase without adding any inducer (Additional file 1, Fig. S1). Fluorescence microscopy analysis showed that during PHB accumulation, the engineered E. coli DH5α was deformed and was longer than normal E. coli cells. To realize PHB mobilization in E. coli DH5α (pSCP-CAB), the phaZ 1 gene from Ralstonia eutropha was introduced using again the stress induced system. The expression of phaZ 1 in E. coli was confirmed by SDS page (data not shown) and by 3HB releasing analysis of the engineered strain E. coli DH5α (pQWQ2/pSCP-CAB) (Fig. 1). Cultivation of PHB mobilization strain E. coli DH5α (pQWQ2/pSCP-CAB). (Filled circle) cell dry weight (CDW); (filled square) glucose consumption; (gray bars) PHB content; (filled triangle) extracellular 3HB concentration. In natural PHB accumulation bacteria, PHB is accumulated and mobilized inside the cells when bacteria are in imbalance of carbon and nitrogen nourishment . Nitrogen availability is a limiting factor for bacterial growth, especially in some nitrogen-poor environments. These conditions of suboptimal growth are conducive to the production of PHAs . Thus, nitrogen limitation is the key factor for PHB biosynthesis induction in natural PHB production bacteria. To investigate if the nitrogen limitation also induce PHB production in engineered E. coli, various amount of nitrogen (NH4Cl, 0.2 g/L, 1 g/L, 2.5 g/L, 5 g/L) was tested in M9 medium supplied with glucose as carbon source. Experiment results showed that low nitrogen concentration led to the fast and high PHB accumulation in our engineered E. coli (Fig. 2). The initial PHB accumulation (within 20 hours) was varied from 69% to 15% of cell dry weight with gradually increased nitrogen concentrations. The more NH4Cl supplied in the medium, the less PHB accumulated in the cells. This phenomenon indicated that nitrogen source limitation served as a stress and induced the transcription of the stress-induced promoter. Induction of PHB accumulation in engineered E. coli DH5α (pQWQ2/pSCP-CAB) by nitrogen limitation. 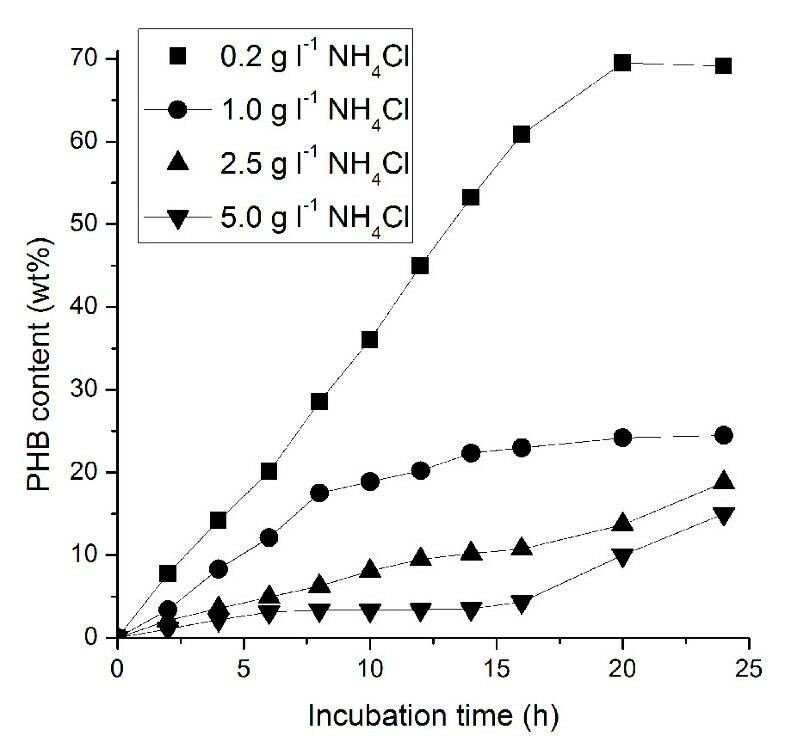 (R)-3-hydroxybutyric acid (3HB) secretion was detected in the culture supernatant of E. coli DH5α (pQWQ2/pSCP-CAB), indicating the realization of PHB mobilization in the engineered E. coli (Fig. 1). The 3HB appeared in the medium after 20 hours cultivation along with the PHB formation without additional induction; then the 3HB concentration increased to 0.72 g/L at 40 h. However, the 3HB secretion rate is lower than PHB accumulation rate since the intracellular PHB was accumulated. After that, the 3HB concentration decreased slowly to 0.45 g/L. The slow decrease of 3HB concentration in the medium implied the re-utilization of 3HB by the cells at certain conditions. In recombinant E. coli without a phaZ 1 gene, only little 3HB was detected (0.003 g/L) in culture medium. To confirm the capability of 3HB utilization by E. coli, an in vitro experiment of 3-hydroxybutyral-CoA synthetase activity measurement was performed. When the E. coli crude enzyme extract was incubated with CoA, ATP, MgCl2, DTT and 3HB at 37°C, a depletion of 3HB was observed using HPLC analysis (Table 1). When any of the reacting compounds, such as CoA, ATP, MgCl2 or DTT, was omitted from the reaction mixture or when the E. coli crude enzyme extract was treated at 95°C for 5 min prior to the assay, there was almost no depletion of 3HB was detected. This demonstrated that an enzymatic activity of acyl-CoA synthetase existed and 3HB can be converted to 3HB-CoA in vivo. The consumption of 3HB as carbon and energy source indicated that the complete PHB mobilization in engineered E. coli was realized. In order to confirm the complete PHB mobilization in engineered E. coli, all the strains were examined for long term starvation in M9 medium without carbon source (32 days). Fig 3A showed that the cell number of all strains began to reduce gradually from the third day of the starvation except the PHB mobilization strain E. coli DH5α (pQWQ2/pSCP-CAB), which exhibited an obvious multiplication during starvation. 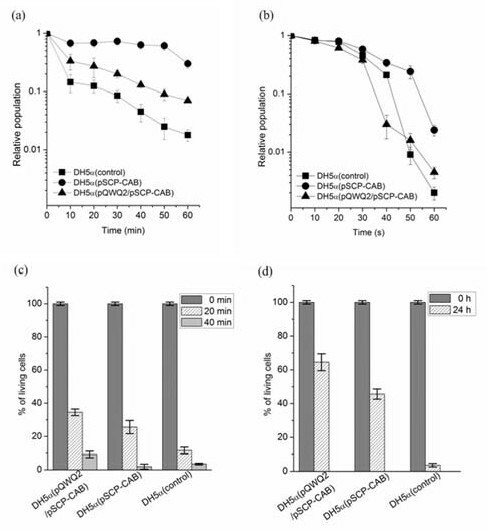 At the end of the starvation, the cell population of E. coli DH5α (pQWQ2/pSCP-CAB) increased by three-fold while the other strains without a PHB mobilization system had a under 1% of survival (Fig. 3A). Only about 4% of the cells survived when E. coli DH5α (pQWQ2/pSCP-CAB) was incubated in potassium phosphate buffer without nitrogen source or carbon source (Additional file 1, Fig. S2). This result proved the necessity of nitrogen for the survival and multiplication during the starvation. 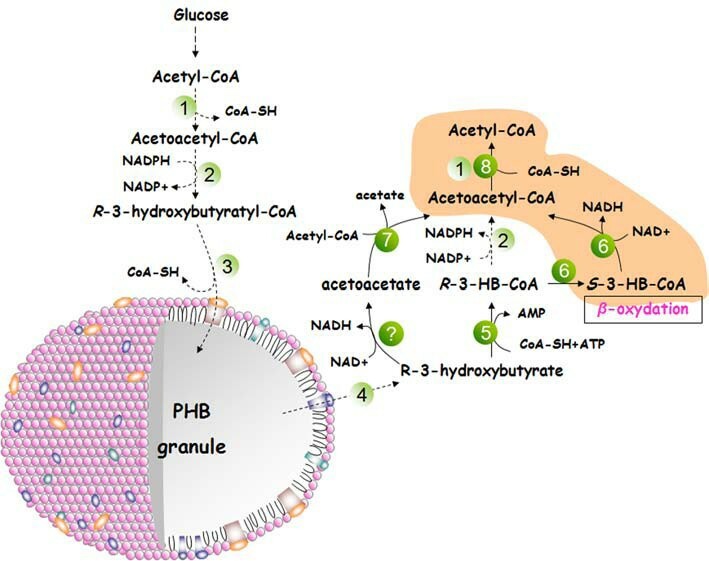 After being starved for 32 days, E. coli DH5α (pQWQ2/pSCP-CAB) consumed 72% of its intracellular PHB, indicating the re-utilization of PHB as carbon and energy source (Fig. 3B). During the starvation experiment, we found that the free 3HB of E. coli DH5α (pQWQ2/pSCP-CAB) in the medium was maintained at a low level of about 0.1-0.2 g/L. Calculation of the PHB degradation revealed that totally about 0.8 g/L 3HB was produced by depolymerization of PHB during the starvation. This indicated that E. coli DH5α (pQWQ2/pSCP-CAB) consumed 0.6 g/L 3HB for carbon and energy. This data further confirmed the existing of PHB cycle in E. coli DH5α (pQWQ2/pSCP-CAB). Effect of PHB mobilization on the survival of starved E. coli strains. (a) Relative survival rate. (Filled square) E. coli DH5α; (filled circle) E. coli DH5α (pSCP-CAB); (filled triangle) E. coli DH5α (pQWQ2/pSCP-CAB). (b) PHB consumption and 3HB secretion during starvation. (Filled circle) relative PHB content of E. coli DH5α (pSCP-CAB); (filled triangle) relative PHB content of E. coli DH5α (pQWQ2/pSCP-CAB); (filled pentacle) 3HB secretion of E. coli DH5α (pQWQ2/pSCP-CAB). Then, the engineered E. coli was used to investigate stress resistance capability. E. coli strain with PHB production or mobilization was confirmed to exhibit a changed stress capability (Fig. 4). When strains were incubated at 65°C in a water-bath, the PHB production strain, E. coli DH5α (pSCP-CAB), and PHB mobilization strain, E. coli DH5α (pQWQ2/pSCP-CAB), exhibited an increased heat resistance compared with the control strain (Fig. 4A). After 60 min of heating, about 30% and 7% of the initial number of cells remained alive, as compared to only 1.8% for the control strain. Likewise, E. coli DH5α (pSCP-CAB) and E. coli DH5α (pQWQ2/pSCP-CAB) showed an increased tolerance to UV irradiation compare to wild type E. coli (Fig. 4B). Acid resistance of the three strains was also studied: E. coli DH5α (pQWQ2/pSCP-CAB) exhibited a highest survival rate among the three strains (Fig. 4C). By 20 min of acid treatment, cell viability in E. coli DH5α (pQWQ2/pSCP-CAB), E. coli DH5α (pSCP-CAB) and E. coli DH5α control was reduced to 34.5%, 25.6% and 11.6% of the initial number of inoculated cells, respectively. By 40 min of acid treatment, cell viability was reduced to 9.4%, 3.2% and 1.8% of the initial number of inoculated cells, respectively. 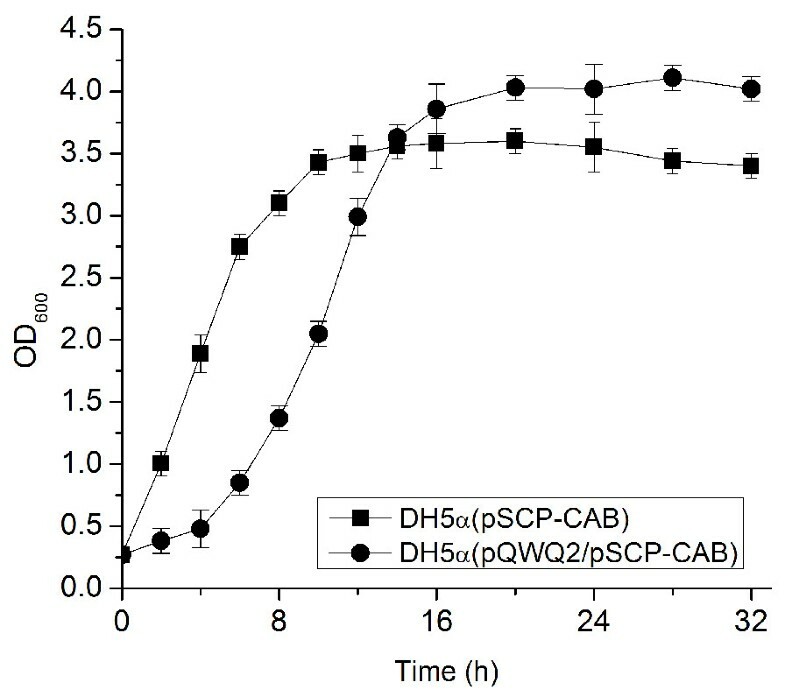 E. coli DH5α (pQWQ2/pSCP-CAB) also exhibited the highest survival rate when treated by a glucose-induced osmotic pressure (Fig. 4D). The viability of the E. coli DH5α control strain was especially affected by high concentration of glucose. Only about 2% of cells were alive when treated with 25% glucose. Interestingly, we found E. coli with PHB mobilization system exhibited a better growth compared with that with only PHB production system although E. coli DH5α (pQWQ2/pSCP-CAB) showed a long lag phase (Fig. 5). Effect of heat shock (a), ultraviolet irradiation (b), acid (c) and osmotic pressure (d) on the survival of different E. coli strains. Each experiment was performed at least three times. The error bars indicate standard deviations. Cell growth comparison of E. coli DH5α (pSCP-CAB) and E. coli DH5α (pQWQ2/pSCP-CAB). Growth was measured in LB medium with 20 g/L glucose without pH control. Many studies showed that PHA biosynthesis would be promoted under nitrogen-deficient conditions in micro-organisms . Under nitrogen deficient conditions, the metabolism of TCA cycle will be repressed, resulting in an increase of acetyl-CoA. Thus, the surplus of acetyl-CoA would be redirected to the PHA biosynthesis. While facing different stresses, such as low nutrient availability, especially carbon source limitation, these bacteria begin to mobilize PHA to conquer those unfavorable environments. In this study, we constructed a PHB mobilization system in E. coli using the stress induced promoter. The rpoS promoter in E. coli was confirmed previously to be induced under various stress conditions, such as cold shock, pH stress as well as cell density . Some reports also pointed out that in E. coli the levels of sigma factor, RpoS, increase in response to starvation for carbon, nitrogen, or phosphate sources as well as for amino acids . Here we confirmed that this stress induced promoter of rpoS can be induced under nitrogen limitation, which is a PHA accumulation condition in PHA producing micro-organisms. Thus, the PHB accumulation process in engineered E. coli under nitrogen limitation is similar as that in natural PHB producer. In micro-organisms, PHA formation and mobilization is an important process for stress survival [24–27]. PHA formation provided the host with carbon and energy storage [2, 28], while PHB mobilization is also of great importance. Previous studies indicated that incomplete PHB mobilization system, like a phaZ mutant (lacking PHB depolymerase) of Azospirillum brasilense, showed low stress endurance in various challenges [29, 30]. In this study, we constructed a PHB mobilization system in engineered E. coli. We found that a stress induced PHB mobilization remarkably improved the carbon starvation tolerance of the E. coli host cell. Meanwhile, the PHB mobilization in engineered E. coli also provided the host with some other stress resistance. The mechanisms by which the PHA cycle favors stress alleviation are not yet fully understood [26, 29]. We supposed that at least two reasons are responsible for the improved stress resistance in engineered E. coli strains. First, PHA mobilization may work at the small-molecule levels. It was found that a rise in ATP and guanosine tetraphosphate (ppGpp) levels was concomitant with PHA degradation in Pseudomonas oleovorans . While the ppGpp was found to increase mRNA translation of the central stationary phase regulator rpoS , which up-regulates resistance to environmental stress [32–34]. Recently, it was found that the enhanced cross-tolerance to different stress agents during PHA-depolymerization in P. oleovorans is related to an increase in the intracellular concentration of RpoS . Second, PHA mobilization may influence the chaperone protein levels. It was demonstrated that the large amount PHB accumulation in recombinant E. coli acted as a stress on the cells, which reduced the cells' ability to synthesize metabolic proteins and induced the expression of various protective proteins. Three heat shock proteins (GroEL, GroES, and DnaK) were significantly up-regulated in PHB-accumulating cells of E. coli as it was shown by proteome analysis . The heat shock protein HspA was reported to be synthesized and bound to the PHB granule surface, indicating that E. coli also synthesizes protective proteins to reduce stress by binding these proteins to recombinant expressed inclusion bodies . These protective proteins are helpful to the overall stress resistance of the host. The secretion of 3HB in E. coli has also been observed in some previous experiments [9, 38, 39]. In this study, we observed the consumption of 3HB as carbon and energy source in engineered E. coli. The confirmation that 3HB can be converted into 3HB-CoA in vivo indicated the existence of a complete PHB cycle in engineered E. coli, from acetyl-CoA to PHB and from PHB to acetyl-CoA. This complete PHB mobilization is the reason of enhanced starvation and stress tolerance of the host. It was reported that a broad-substrate-ranged thioesterase YciA from E. coli mediated CoA-activation of the corresponding carboxylic acid, which supports the possibility of 3HB-CoA formation from 3HB in E. coli . The PHB depolymerization rate is low in recombinant E. coli, thus we could not easily observe the 3HB accumulation under normal conditions. This is the first description that heterologous expression PHB mobilization system may change the stress resistance of the engineered E. coli. All previous experiments that concerned PHB mobilization and indicated altered stress resistance capability were done by knocking out key enzyme involved in PHB production in natural PHB production strains [29, 30]. Taking advantage of the knowledge acquired previously and our findings in this study, we developed a schematic pathway to gain insight into the possible PHB mobilization routes in engineered E. coli (Fig. 6). The proposed pathway established in recombinant E. coli in vivo can mimic PHB cycle of the natural PHB producers: 3-HB, which proved to be actived to a CoA-link form, will be reversibly catalyzed by acetoacetyl-CoA reductase and β-ketothiolase to acetyl-CoA or will serve as a linker between the PHB mobilization with β-oxidation pathway. Supposed metabolic network between PHB biosynthesis and mobilization in recombinant E. coli DH5α (pQWQ2/pSCP-CAB). Dashed lines represent enzymatic steps engineered in recombinant E. coli. Solid lines represent enzymatic steps existed in wild type E. coli. A question mark denotes unidentified enzyme in E. coli. ① β-ketothiolase, PhaA ② NADPH-dependent acetoacetyl-CoA reductase, PhaB ③ PHB synthase, PhaC ④ PHB depolymerase, PhaZ ⑤ acyl-CoA synthetase or thioesterase ⑥ 3-hydroxyacyl-CoA dehydrogenase, 3-hydroxybutyryl-CoA epimerase, FadB ⑦ acetoacetyl-CoA transferase, AtoA, AtoD ⑧ acetyl-CoA acetyltransferase, AtoB. The PHB mobilization in E. coli that served as an intracellular energy and carbon storage changed the stress resistance of the host, which can enhance survival of E. coli when these sources are limited. Accumulation of PHB in succinate producing E. coli was confirmed to increase host resistance and showed a beneficial effect on succinate production (data submitted). Recombinant E. coli with PHB mobilization can also serve as immobilized cell factories for non-substrate/energy related biocatalysis and biotransformation since the cell number was not reduced even after long term incubation without carbon resource. Escherichia coli strains were grown in Luria-Bertani medium (LB) at 37°C. Antibiotics were added to the corresponding cultures at a final concentration of 100 μg/mL ampicillin and 50 μg/mL spectinomycine for the maintenance of plasmids when necessary. For PHB production, E. coli pre-culture (0.5 mL) was inoculated into 50 mL LB or M9 medium supplemented with 2% (w/v) glucose as the sole carbon source in a 300-mL shake flask for 72 h. To analyze the PHB accumulation of recombinant E. coli under different C/N ratio (nitrogen limitation condition), various amount of nitrogen (0.2 g/L NH4Cl, 1 g/L NH4Cl, 2.5 g/L NH4Cl and 5 g/L NH4Cl) were used. The basal medium was 15.138 g/L Na2HPO4·H2O, 3 g/L KH2PO4, 0.5 g/L NaCl, 1 mg/L Thiamine VB1, 1 mM MgSO4 and 0.1 mM CaCl2 supplemented with 16 g/L glucose as carbon source. DNA manipulation was performed by standard procedures . Chromosomal DNA of R. eutropha was prepared by genomic DNA purification kit (Fermentas Inc.). PCR was carried out with an automatic thermal cycler (Takara Shuzo Co., Kyoto, Japan). Primer pair 5'- AAAGGATCCGCCTGCACAAAATTCCACCGTTGCTG and 5'-TTTGGGCCCCCCCTCGAGGTCGACGGTAT were used to amplify the stress-induced region (SIR) fragment from pQKZ100 . The SIR fragment included rpoS promoter and the 5'-untranslated regulation region of rpoS gene. Primer pair 5'-TTTGGATCCCGACAGTAAGACGGGTAAGCCTGTTGATGAT and 5'-ACTGGGCCCGAGCTCCTTGAACGAATTGTTAGACATTATTTG were used to amplify the stable low copy number plasmid vector pCL1920 . The two PCR products were digested with Bam HI and Apa I, and ligated to form plasmid pSCP. Fragment of 5.4 kb Sma I - Eco RI phbCAB operon from pBHR68  was subcloned into pSCP, which resulted in plasmids pSCP-CAB. To construct the phaZ 1 expression plasmid, the intact phaZ 1 gene was amplified by PCR using the genomic DNA from R. eutropha as template with a pair of primers (5'-ATAAGCTTAAGGAGAATGCTCTACCAATTGCATGAGTT and 5'-ATCTCGAGTTACCTGGTGGCCGAGGCCT). The PCR product was digested with Hin dIII and Xho I and inserted into corresponding sites of pQKZ100, resulting plasmid pQWQ2. After cultivation in M9 medium supplemented with 2% (w/v) glucose, cells were collected and washed twice by centrifugation at 4,000 g for 10 min and re-suspended in M9 medium without carbon source. The number of viable cells (CFU/mL) was determined by dilution plating prior to and at the end of each experiment (three replicates). For each experiment, the same initial number of cells was used (between 1 × 107 and 1 × 108 cells/mL). In heat resistance experiment, cells were incubated in a water-bath at 65°C for a total of 60 min. Samples (10 μL) were taken every 20 min to test the survival rate. The resistance test of UV irradiation was performed by placing 10 mL of cells in 90 mm Petri dishes and by exposing to short-wave UV irradiation (254 nm) from a Lourmat VL-6 LC UV lamp for 60 s. The UV treated cells were collected and re-suspended in potassium phosphate buffer (0.06 M, pH 6.8) for checking the surviving rate. In the acid resistance experiment, cells were maintained in 0.05 M potassium phosphate buffer (adjusted pH value to 3.0). The sensitivity of cells to osmotic pressure was estimated by adding 25 mL 50% glucose (w/v) solution to 25 mL cell suspension to give a final glucose concentration of 25% (w/v). After cultivation in M9 medium supplemented with 2% (w/v) glucose, cells were collected and washed twice by centrifugation at 4,000 g for 10 min and re-suspended in M9 medium without carbon source (pH 6.8). Cells were then incubated on a shaker at 200 r.p.m for 30 days under starvation conditions . Bacterial density (CFU/mL) was determined by dilution plating (three replicates). Cells were diluted to about 1 × 107 cells/mL. Samples (5 mL) were taken out from culture medium every 2 or 4 hours (before 72 h) or 4 days (after 72 h), and were lyophilized overnight. The PHB content was determined by gas chromatography (GC) after methanolysis of the lyophilized cells in the presence of 15% sulfuric acid. Purified PHB polymer was obtained by chloroform extraction for 72 h and ethanol precipitation at room temperature . Culture supernatants were used to detect the 3HB monomer by high-pressure liquid chromatography (HPLC) on a reversed-phase column (Waters C18; 5 mm, 4.6 mm by 15 cm). 0.02 M NaH2PO4 (pH 2~3) solution was used as the mobile phase at the flow rate of 0.8 mL/min. The acyl-CoA synthetase activity was measured in 100 mM potassium phosphate buffer (pH 7.5) containing 5 mM ATP, 10 mM organic acid, 1.25 mM CoASH, 5 mM dithiothreitol (DTT), 5 mM magnesium chloride. To start the reaction, enzyme sample (20 μL) was added to the assay mixture to form a final volume of 200 μL. After 15 min of incubation at 30°C, the reaction was quenched by adding 20 μL of 10% (v/v) formic acid. 3HB consumption was detected by HPLC as described above. This work was financially supported by research grants from the National High-Tech Research and Development Plan of China (2006AA02Z218), the National Basic Research Program of China (2007CB707803) and a grant from the National Natural Science Foundation of China (30870022). QW carried out most of the experiments and wrote the manuscript. QW and HY carried out the resistance experiment. QW, YX, and ZK constructed the plasmids and strains. QQ conceived of the study, participated in its design, and drafted the manuscript. All authors read and approved the final manuscript.